Your MacBook Pro or PC notebook computer has USB 2.0 ports, and they’ve served you well. Talk about compatibility—keyboards, mice, printers, scanners, joysticks, digital cameras, flash drives—what couldn’t you plug in? Talk about performance—well, that’s where USB ports 2.0 are merely passable—they limit data transfer speeds to around 25–30 MB/s. For most peripherals, that’s perfectly adequate, but when you connect an external drive and expect great performance, that bottleneck is a problem—video editing, backing up, and other data-intensive activities suffer as a result. 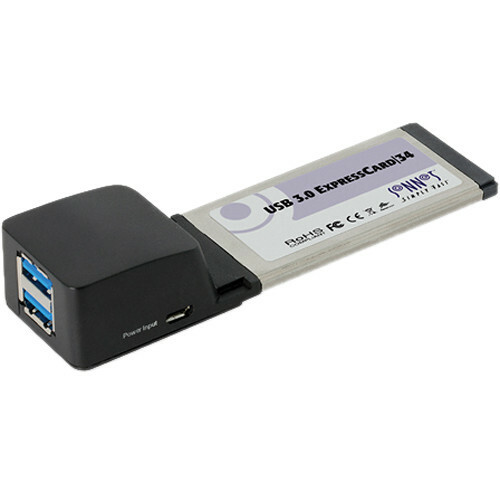 Enter Sonnet’s USB 3.0 ExpressCard/34 adapter(1), the bottleneck breaker! This Sonnet host controller is based on the new USB 3.0 standard that offers up to 10x the performance of the decade-old USB 2.0 interface. A single hard drive with a USB 3.0 interface is capable of transferring data at up to 125 MB/s, while SSDs (solid state drives) are capable of even faster transfers—insert Sonnet's USB 3.0 ExpressCard/34 adapter into your notebook computer's ExpressCard slot to exploit the full performance potential of these fast drives. Sonnet’s USB 3.0 ExpressCard/34 works in ExpressCard/34 and ExpressCard/54 slots. This card supports hot-swappable storage connections. Insert Sonnet's USB 3.0 ExpressCard/34 adapter into your MacBook Pro or PC notebook to experience the super speed of USB 3.0 connectivity firsthand.